How does the redevelopment of a place affect the flow of people within it? What are the small changes that affect how we find our way around? What do these changes look like? These are the questions that arose following my exploration of Hanley town Centre, Stoke on Trent when asked to make a new intervention as part of the Small Change exhibition at airspace gallery. ‘Change in real and imagined cities’ is the focus of the exhibition, so as part of my research I walked the streets of Hanley and Stoke looking for a space that I would respond to. I was looking for spaces where movement occurs, the traces of something that documents a change has taken place. At the end of my first walk I came across a number of bus shelters with signs advising that the bus stop was closed. This space, where you expect a bus to arrive that never will, intrigued me. 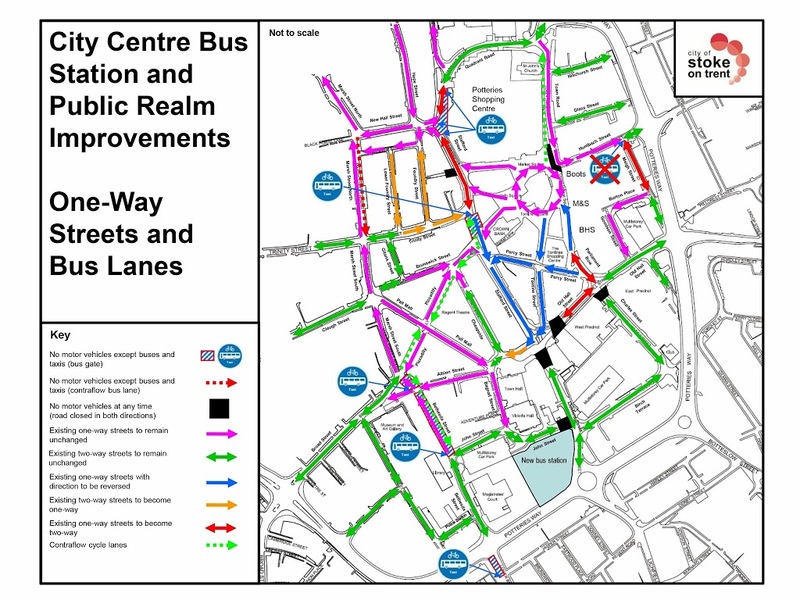 The building of a shiny new bus station has formed part of a programme of changes to the town centre which involves pedestrianisation of public spaces and the re-flowing of traffic through the town centre. Stafford Street is one of the main thoroughfares in Hanley that has had it’s one way flow of traffic reversed, resulting in four bus shelters now being on the wrong side of the street and therefore out of use. It was this simple act of reversing the flow of traffic that I decided to make a piece of work about. I think of public spaces as potential surfaces to make a drawing on, with the lines I draw or the marks I make describing some sort of movement within that space. 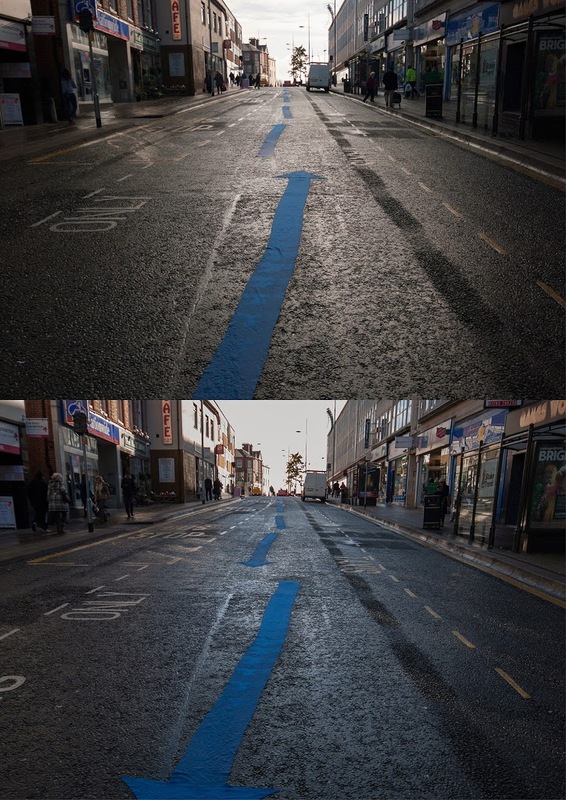 I hatched a plan to mark how the movement on this street had been altered using blue arrows that referenced both the standard ‘one way’ signs and the plans issued by the City Council to communicate the re-organisation of the road network. 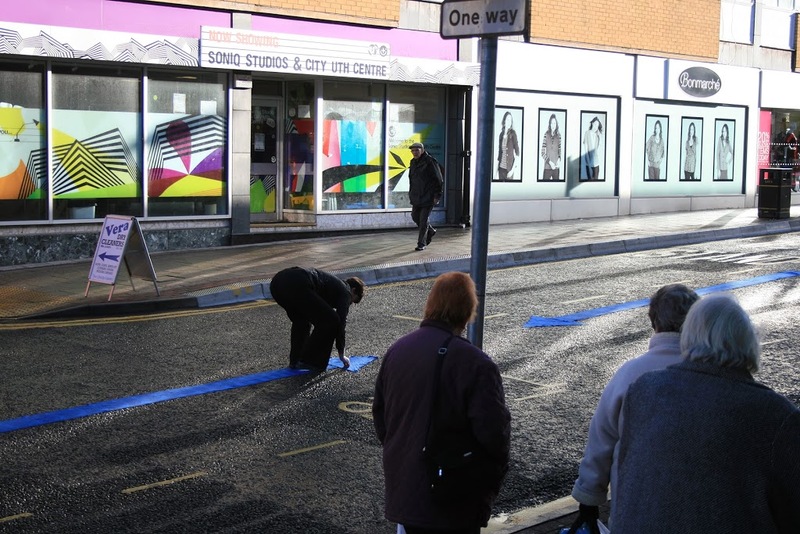 I laid ten 6m long lines cut from blue felt fabric along the centre of Stafford Street in Hanley, Stoke on Trent, cutting between other road markings. 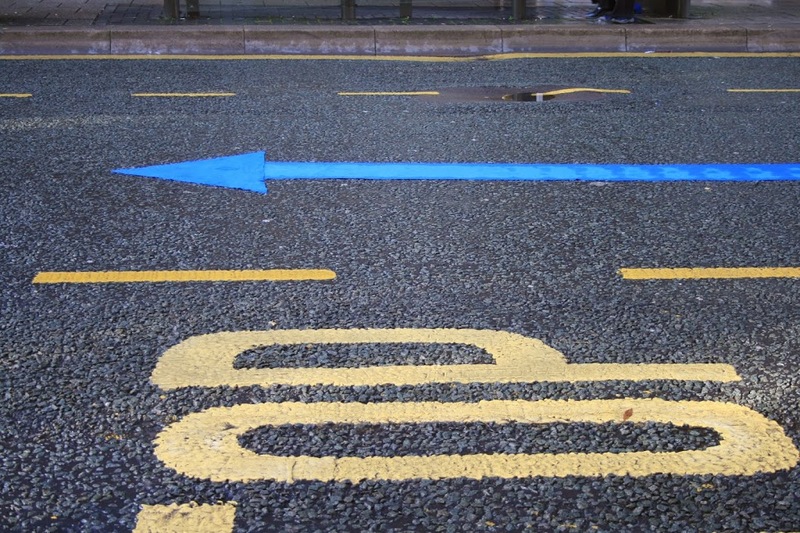 Starting at the south end of the road, which has been closed at one end for public realm improvements, I placed a blue triangle on the far end of the blue line, creating an arrow pointing uphill. Repeating this action for each of the lines resulted in a passageway of arrows all pointing north. Passers by asked questions of my photographers, a delivery driver drove his van ever so slowly alongside the arrows taking great care not to drive over them and one man asked me where the taxi rank had moved to. I started to notice where the previous road markings for the bus stops had been burnt and chipped away leaving a coarse road surface. After a short pause after reaching the top of the street I removed the arrowhead from one end of the line and placed it at the other end. Repeating this action, the flow of the drawing changed to end up with all the arrows pointing downhill. Another short pause, then repeat; turn all the arrows to face uphill, pause, turn all the arrows to face downhill. Then remove the arrows from the street and leave. For more information about Small Change and airspace gallery, take a look around their website.